Of all the bog plants in the aquatic landscape everyone seems to loves Horsetails. They are easy to grow and easy to care for. They have very wet feet and can grow in your pond or in wet boggy areas outside of your pond. It is important to remember like all other bog plants that you add to your Koi pond or water garden it must not be to deep. It is recommended to maintain your bog plant in a pot. Never have more than 2 inches of water above the pot. We use a heavy clay and DG soil for best growth as well as a Laguna fertilizer stike. Horsetail rush stems erect 2-5 ft. tall, ridged, dark evergreen, jointed nodes, conspicuous blackish rings around the nodes, hollow between nodes; leaves reduced to very small node-scales; cone-like structure a stem tip is called a “strobilus”, to 1 in. long; strobili contain sporangia which produce green reproductive spores, strobili are various shades of brown. Horsetail rush plants call for either full or filtered sun for successful cultivation. The plants can handle prolonged periods of wet weather, but it is important to make sure that they never become submerged. Soil that is both cool and consistently moist is ideal for growing horsetail rush plants, including the boggy soils of woodlands. Fertilization is not necessary. The plant spreads via underground rhizomes, and can be propagated easily through the division of the clumps. 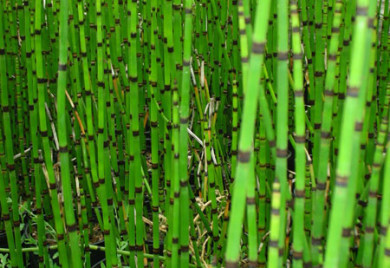 Horsetail Rush, also called Scouring Rush, is a hollow and non-flowering cane-like plant that have survived for literally millions of years, representing one of the oldest types of bog plants available. 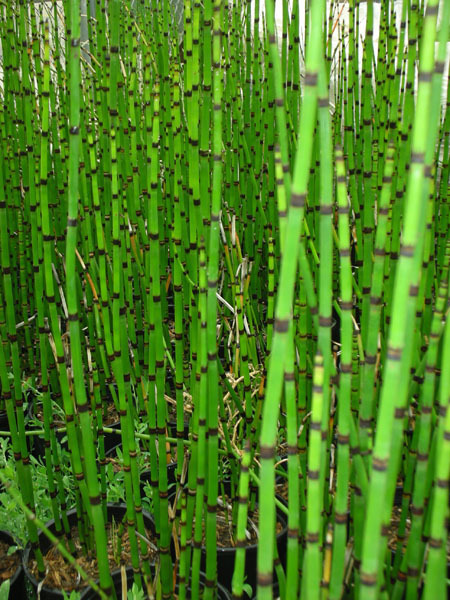 Most varieties of Horsetail Rush can attain a height of up to three feet and will keep their green color year-round.